Valentine’s Day is just around the corner, and to celebrate, Kokakiki have released a special edition of their pig-matching game Tweens. Adding 20 new levels to the 75 that were in the original game, the Valentine’s version adds a new twist to what is already an addictive game. The basic premise of Tweens is to match pigs of the same colour within the time limit. You need to find pigs with no other pigs or obstacles between them, but holding your finger on a pig for a few seconds turns it into a “rocket pig” which can fly across the screen to its target. Bonuses can be earned through racking up combos of matches, be it the same colour or different colours in a row. 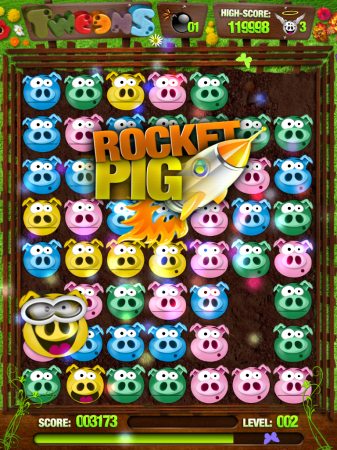 Get enough successive differently-coloured matches and Rainbow Rampage mode is unlocked, in which all pigs turn the same colour for a short time – great for quickly clearing the screen. As levels progress, various obstacles appear in the game, such as rocks, sheep and dogs, all of which can get in the way of the pig matching. Help can be found in the form of bombs, gained through the challenges which appear every few levels, which clear a large area of the board in one go. They’re great for getting out of difficulty in the later levels when more and more obstacles start appearing. It’s all good fun – it’s easy to blast through the first few levels before the difficulty starts to crank up. The Valentine’s edition, however, is harder from the off, as you now need to match pigs not only of the same colour but also of different gender – the female pigs are identified by the bow on their head. 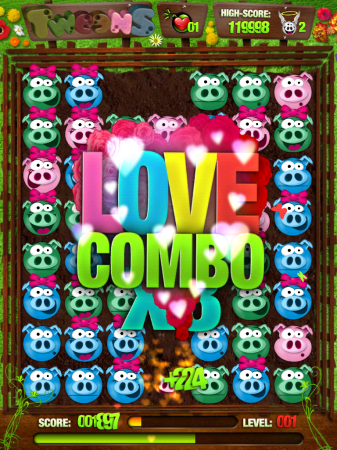 This change requires the palyer to look a bit more closely at the game to get the right matches, and with the time running out it’s easy to fall over as you try to match two male pigs. Overall, Tweens is a great little puzzle game which is easy to pick up and play when you have a spare five minutes – although be warned, it has that addictive quality which can easily see five minutes turn into half an hour. Bright, colourful graphics and a good soundtrack add to the experience. The game also has leaderboards and Game Center support, with 70 achievements available. The Valentine’s edition of Tweens is available in both standard and HD versions, available now from the App Store for 69p – half the original price. 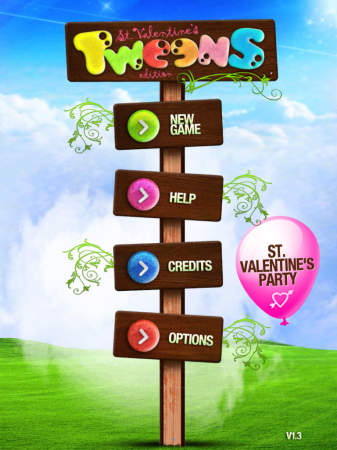 For those who already have the original Tweens, the Valentine’s edition is available as a free update. If you want to get a feel for how the game plays, check out the video below. 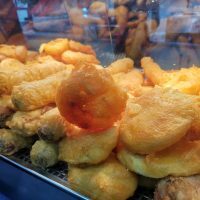 The Full Monty Plan - Now giving full speed ?